Forty-Fives (also known as Forty-Five, Forte Fives, Auction Forty-Fives, Auction 120s, 120, Growl, Spoil Five, Maw and Strong Fives) is a trick-taking card game that originated in Ireland. It's well known in Eastern Canada and played on the Gaspé Coast in Québec, in Newfoundland, New Brunswick, Prince Edward Island, and Nova Scotia. There are slight variations across the provinces. There are variations of the game. Traditional Forty Fives goes to a score of 45 point (hence the name of the game). Auction Forty Fives goes to a score of 120 points and requires bidding. In many areas outside of Canada, Auction Forty Fives is simply referred to as Forty Fives. Although the number 45 has no relevance to Auction Forty Fives, the name persisted. Auction Forty Fives is closely related to the game One-hundred and ten (110) also described below. Forty-Fives is a descendant of the Irish game Spoil Five, which in turn is a descendant of a game that King James VI of Scotland popularized in the 17th century called Maw. Maw was first seen being played in 1511 and the earliest written rules of 1576, the incomplete "Groom Porter's lawes at Mawe," may have originated from Scotland. James VI was recorded playing "Maye" at Kinneil House at Christmas 1588. In the 1920s, French Canadian immigrants moved south into the Merrimack Valley of Massachusetts and New Hampshire and introduced the game there where it continues to be popular, sometimes under the French name quarante-cinq. The game is most popular in southern New Hampshire and northeastern Massachusetts. Forty fives tournaments are becoming more popular. In New England, the New England Academy of 45s holds occasional tournaments in Plaistow, New Hampshire. Also, Methuen, located in the Merrimack Valley, recently held a 45s tournament. John Cavanaugh and Ryan Gill are currently tied for the #1 ranked player spot in the world. A popular pastime on Dog Beach in Newbury, Massachusetts is to play auction 45's, at low tide during green head season. Forty-fives is popularly played on the West Coast of the South Island of New Zealand. Regular 45's Tournaments are held as a fun night out in locations like Workingman's clubs and RSA buildings. Serious competition tournaments are held yearly. There was a large percentage of Irish immigrants on the West Coast, normally around a third of immigrants to this region of New Zealand in colonial times, and the game of 45s originated from among these immigrants. On Cape Breton Island, notably in Richmond County, there are 45-Card-Games in almost all communities. This may involve tens or hundreds of people depending on the size of the jackpot. Generally 25 games are played in an evening, couples only, usually lasting about two hours. Winning teams rotate around the room, while the losers remain stationary. Winners always deal first. Each couple has a small cue card with the numbers 1 through 25, wins are punched out with a hole punch. Usually there are three winners for the evening, the teams with the highest number of games. Ties may be broken by splitting the prize, cutting the deck for low card win, or playing off. If one party wants to play-off, others either do so or forfeit; splitting must be unanimous. Thus, if two couples have 18 games, a third couple 16 games and a fourth and fifth couple 15 games, then the third couple is automatically the second place winner. First and third place prizes are either split, or the deck is cut, or there is a play-off. Sometimes there is a cookie jar, where a couple can attempt to win eight or ten randomly chosen games. Sometimes there is a consolation-like boobie prize for the team with the fewest games. Cards are valued in the following order, depending on trump suit, where A♥ is the Ace of Hearts. If no trump card is played during the trick, the value is awarded according to the off-suit rules listed below. In the absence of a trump card, the winning suit is always the suit led. The rank of cards depends on a number of factors, the foremost being what suit is trump. A basic way it is commonly thought of is "red is high, black is low." The game is played with a regular deck of 52 cards. Jokers are not used. Players get 5 cards each. Each player is dealt three cards at once, starting with the player left of the dealer and continuing in a clockwise-direction. Then each player is dealt two cards at once in the same order. The dealer never deals more than three cards at a time. The top card of the deck is turned face up. The card that is shown determines the trump suit and that card is left on top of the deck. If an Ace is turned up, that is the trump suit but the dealer must immediately claim the Ace by discarding one of his dealt cards. If any of the players is dealt the Ace of the trump suit, then he may claim the card that was turned up by discarding one of his other cards. This must be done before he plays his first card. Each round, where every player plays a card, is called a "trick". One card is played by each player, in turn, starting with the player to the left of the dealer. The winner of the trick is determined by who played the highest card. The winner gets five points (on his way to 45). A bonus trick worth ten points rather than five points is awarded for the best card played during the round. This is determined at the end of the round. Players must always follow the suit of the leading card. The leading card can only be bettered with a better card in the same suit or with a trump. Any trump suit card beats every non-trump suit card. 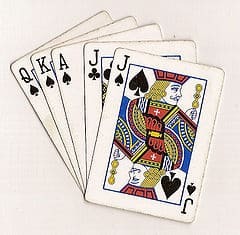 The only time in which a player may choose not to follow trump suit is when the only trump card he has is the five, jack or ace of hearts or if he does not have any cards of the trump suit. A player might wish to save the most powerful cards if he believes that another player is saving another strong card, or until he believes the other trump cards have been exhausted so that he can have the advantage of leading the remaining tricks. The action of holding a card in this fashion is known as "reneging." If the Ace of Hearts is led, players must always play a trump card to follow suit. If they have no trump (and trump is not Hearts) they must play a Heart if there is one in hand. If they have no trump or Heart they may play any other card. Once a player has revealed his card to players, that card is deemed to be played. Points are added up based on tricks won and the bonus trick at the end of the round. If a player reached 45 points or more (including points earned in previous rounds), that player wins. If more than one player reaches at least 45 points in the same round, the player with more points is the winner. If no player reaches 45 points, the deal is given to the player to the left of the last dealer and a new round begins. Scores after the first round are as follows: Full 30, 25-5, 20-10 or Two 15's. Note that the total must be 30. Scores after the second round are as follows: Win, 40-20, 35-25 or Two 30's. Note that the total must be 60. The score of the game is not written down, simply remembered by the players. If many games are played one should keep track of the number of games won. If it happens that all players have no trump, hence no best trump then the score after a round will only add up to 25. Same as rules for the game going to 45points except that the game goes to 120 points. There are three styles of play. Heads Up: Two players, one on one. Cut-throat: Three players, in this game after a player wins the bet and calls the Trump, the other two players form a temporary unspoken truce to try to 'Shoot' the bidder. Players who do not honor this truce are seen as selfish and called 'Nickel Grabbers' (each 'Trick' is worth 5 points). Five-Way Cut-throat: Similar to normal 3 man cut throat. In this game it is much harder to make your bid as it tends to be 4 vs. 1 and the bidder is often shot. Partners: Either four or six players, with partners sitting opposite. Partners points are pooled towards overall score, and towards bid. The game play and ranks of cards is the same as Forty Fives. Instead of the top card being turned over after the deal and determining trump, players bid based on the strength of their hand. Bidding is done before a trump suit is declared. Players bid 15, 20, 25, or 30 points based on how many points they think they can earn with their hand if they get to call the trump suit. Bidding goes in the same order as the deal. If no one bids, choosing instead to pass, then the dealer automatically bids 15 and play resumes as normal. When this happens the dealer is said to have been "bagged". The player who wins the bid announces the trump suit. After trump is called (it is important for trump to be called prior to this step), the person who called trump adds the kitty to their hand. The bidder must have at least one trump card to call a given trump. Players then discard any unwanted cards (usually non-trump suited cards except for the Ace of Hearts). If it is a six player game, then each player must keep a minimum of two cards to ensure cards don't run out. In a five player game they must keep at least one card. The winning bidder may not keep more than five cards. In the same order as the original deal, the dealer replenishes each player's hand so that all players have five cards. The person to the immediate left of the winning bidder plays first. The first card thrown is said to have been "led". If the card led is in the trump suit, then each player must play a card of the trump suit if possible. The Ace of Hearts is always considered part of the trump suit. If a player breaks this rule they are said to have "reneged". The winning bidder does not have to lead play with trump suit nor do players have to lead with trump suit when they lead a trick but players must play trump suit if a trump suit card is played in the trick and they have a trump suit card remaining in their hand. When points are counted at the end of the round, the winning bidder adds their point total only if it equals or beats their bid. If they do not "meet their bid" they instead subtract their bid amount. This is known as being "set", "shot", or "setting the bidder" The object for the players that did not win the bid, therefore, is to make as many points as possible while at the same time preventing the bidder from making their bid. The trick with the highest ranked card of the hand is the bonus trick, and is worth 10 points. A player who is within 30 points of 120 is said to be "on the green". This means they are one hand away from winning the game. 120 points wins the game. Winning the game is referred to as "going out". If multiple players go out on the same hand, then the player who bid that hand wins. This is referred to as "Bidder goes out". If the bidder obtains or exceeds his bid his score increases by that amount, if he fails to reach his bid his score is reduced by the amount of the bid. The object for the players that did not win the bid, therefore, is to make as many points as possible while at the same time preventing the bidder from making their bid. Once a player or team reaches 100 points they must win the bid to receive points. The other players will go up or down but they will stay at the same score. They are locked in at that score unless they win the bid. Once they win the bid they will either win the game or go down depending on if they make the bid or not. This encourages the remaining players to bid against a player who is approaching 120, so that he will rarely be able to win the bid cheaply. Before the deal, the player to the right of the dealer must cut the deck. For the next round the deal passes to the dealer's left, so the dealer of one round always cuts in the next round, should there be one. One may deal two cards to all players and then three cards to all players if desired. This is the dealer's choice. Two cards first is sometimes called the Newfoundland Deal," the "Rocky Bay Deal," or the "Dog Beach Deal." The bidder may discard their hand and "go on the kitty". This means they can choose the trump only from the cards in the kitty. A variation on this is to even reject going on the kitty and instead "go on the top card". This means that a player discards the kitty and is dealt a single card which they must declare as trump. Players may discard all five cards, but when being replenished, the fifth card is dealt face-up. This is known as "four and a flip". In most games, it is considered appropriate to ask if a player is "booked." To be "booked" is to have only cards of the trump suit. In this case, the asking player may then choose to fold or stay in the game. If a player or team wins when the opponents start the round with 40 points, it is called hanging a 40. Someone leading the Ace of Hearts might say "Hearts on Hearts" so that no one reneges. No reneging allowed or only the 5 of trump may be reneged. Any player whose score hits exactly "45" is set back to Zero - The dreaded Forty-Five Rule. Only the 5 is worth 10 points. If the 5 isn't dealt and played, then the hand only has a total of 25 points. Scores below zero are called "in the hole" or "in the box". A player cannot be removed from the game for having a score that is too low (i.e., there is hope for everyone...even the player at -80); the reason for this is due to the bonus points described below. A player can outbid a 30 point bid by bidding '30 for 60'. This means that if the player doesn't make 30 points, they lose 60 points. Depending on the rules, they could stand to win 60 points if they make their 30 point bid. Some variations also allow a '60 for 120' bid. Even if this rule is respected, it is still very uncommon. 30-for-60: Without looking at one's cards one must call 30-for-60. It is the same as bidding 30 regularly but a player bidding 30-for-60 would get 60 points should they win all the tricks and drop 30 points (as normal) should they lose any tricks. A 30 bid is always called 30 for 60, which means that if the player or team gets all 30 points in the hand they get a bonus of an extra 30 points. If they do not win the bid they only go down 30 points. Thus a team at 65 points that bids 30 for 60 will either win the game or go down to 35 points. Slam: Basically the same as 30-for-60, but the player would get 120 points for winning all tricks and lose 60 if they fail to win all the tricks. A player may Slam at any time after looking at their five cards. One-Hundred and Ten (110) is similar to the Merrimack Valley variant of Forty-Fives. In it, an extra hand is dealt, face down, by the dealer into the centre of the table. No trump card is turned. Once all hands have been dealt the "bidding" begins with the player to the dealer's left, and proceeds in turn around the table. Each player must bid a minimum of fifteen points and five more points than the previous highest bidder, or pass. An exception to this rule is the dealer, who can appropriate (match) the highest bid and force the other players to either raise his bid or pass. Bidding continues to circulate around the table until all players have "passed" (i.e. the same player can bid, be raised, and raise again in turn). When bidding has concluded the highest bidder declares which suit will be trumps. He then takes the hand dealt face down in the centre of the table and chooses his best five cards from the combination of the two hands. Meanwhile the remaining players are entitled to draw up to three cards from the deck, first discarding from their own hand. When all players have obtained their hand the winning bidder has the option of playing first or requiring the player to his left to play first. If a player has the Ace of trumps the player may turn over the cards remaining in the deck stub, one at a time, until a trump card is turned, then he may discard his weakest card in favour of the trump card, or choose not to. A bonus of five points (bonus trick) is awarded to the player who plays the highest card during the course of the round, thus the maximum amount that can be bid or obtained in 30. If the bidder obtains or exceeds his bid his score increases by that amount, if he fails to reach his bid his score is reduced by the amount of the bid. All other players often co-operate (without collusion) to prevent the bidder from reaching his bid, though selfish interests can supersede this. A player cannot progress beyond 105 unless he is the bidder. If a player wins tricks during another players bid, which would otherwise increase his score beyond 105, those scores do not count, nor are they assigned to any of the other players. This encourages the remaining players to bid against a player who is approaching one hundred and ten, so that he will rarely be able to win the bid cheaply. Scores can reduce below zero, it is common to set a cut off point (often minus 80) at which a player is removed from the game. The first player to reach 110 wins the game. Several variations of 110 exist. These include the removal of the Ace of trumps rule, the use of jokers (usually valued just below the jack (knave) of trumps), the bell rule (where a successful call of 30 yields 60 points) and various reneging variations.